I was using my HP12C calculator yesterday and I realized that it is the same calculator I have owned since 1986. 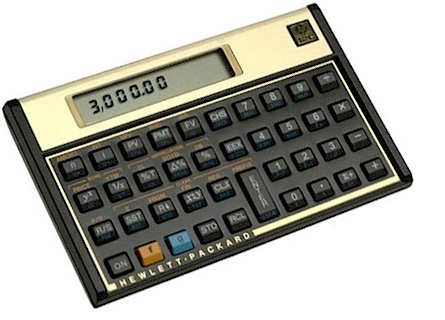 In a time when we have come to view computers and related technology as things that become technically obsolete in 3-5 years, then thrown away and replaced by a newer, faster and cheaper device, I realized that I use the same calculator that I purchased over 25 years ago! Further, it works great and I do not believe that there is a financial calculator on the market today that is more widely used than the venerable HP12C. I actually have 3 of these calculators: the original purchased for around $75 in 1986 was manufactured in the USA; the other two are a brushed aluminum HP12C Platinum model and a HP12C Platinum “25th Anniversary Edition” dated 2006, indicating that the first models were made in 1981. Both of the Platinum models were manufactured in China and purchased a few years ago at about the same $75 price. I guess that some things are truly – ‘built to last’! In business, as in the rest of life, relationships matter. We generally agree this is true. We are also very aware that the day-to-day reality is that we spend our time working on specific projects, requests, and resolving problems for our customers. Very few of us explicitly spend our time on what we would call “relationship building”. We are not talking about playing golf or attending sporting events with customers – although these stereotypical notions of relationship building are valid in certain circumstances. We are talking about spending time with customers in conversation to learn what is important to them in their relationship with us. These conversations are crucial to knowing how to relate to each customer individually. This avoids the “one size fits all” customer relationship model. We define a customer as someone who depends on us for products or services. Author Ray AbidePosted on June 9, 2012 June 14, 2012 Categories General Business1 Comment on It’s All about the Relationship!